June 2017 saw Two Birds Brewing turn six. Among the dozen of their own beers that lined the taps for the big day at at their Nest in Spotswood was a new birthday beer. 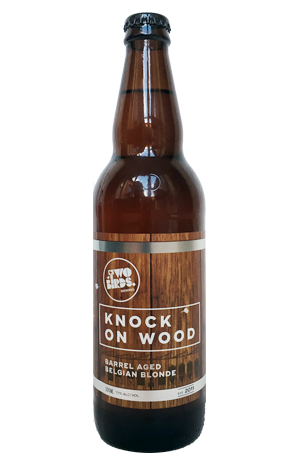 It was Knock On Wood, not just a birthday beer but the brewery's first barrel aged release too – sixth anniversaries are traditionally celebrated with wooden gifts, you see. It's a beer that comes with echoes of the first time we recall Birds co-founder Jayne Lewis playing with wood, back in her days as Mountain Goat's head brewer. Then it was strong Belgian golden ale Rapunzel that spent time in a barrel; this time around it's another pale Belgian getting the treatment. It's come out the other side in the most glistening and golden of manners, mixing up Belgian yeast esters of bubblegum and peach with plenty of oak and vanilla, both aroma and flavour wise, and a spicy, vinous finish.